Sustainability is part of everything we do. We built a print factory on its principles. The design of our building reduces our demand for energy and natural resources making our printing even more efficient. Working with the environment is top of our list, it’s in everything we do. In fact, we were named as one of Cornwall’s most sustainable businesses winning the “Best Managed Medium Business” category of the Cornwall Sustainability Awards 2018. We built our print factory to be efficient using sustainable materials and were awarded an ‘Excellent’ BREEAM rating – the world’s leading sustainability assessment for buildings. We have one of Cornwall’s largest roof-based solar panel arrays, presenting a carbon-saving of at least 45 tonnes per year. Our factory is one of the most environmentally-friendly in the UK. We harvest rainwater for flushing toilets and have grass-topped roofs. We maximise natural ventilation and daylight, and limit heat loss through insulation. Our building features passive and natural ventilation. Air conditioning units are limited to 3 small areas of the business where machinery requires cool temperatures. These rooms also have heat air circulation/ ventilation systems in place. We measure and manage our waste and use of water and energy. We use movement sensors across the building to automatically switch lights on and off, as well as light sensors to automatically switch lights on and off at dusk/dawn. We have introduced a delivery planning and tracking system for our fleet of vans, which calculates the most fuel-efficient routes for conducting each day’s deliveries. We also ensure our production schedules accommodate multiple-drop runs, with the aim of minimising emissions. When it comes to printing, we’re constantly working to increase our efficiency and capacity to deliver the highest sustainability standards, shrinking our carbon footprint, cutting energy consumption and reducing waste. In 2018 we made a major investment in a brand new lithographic printing press and associated plate maker – energy efficiency and sustainability were two of the key factors behind our decision. The Ryobi Mitsubishi 9 Series Press uses LED-UV drying technology instead of traditional bulbs. This not only means that the ink is instantly dry, but uses substantially less energy than the press it replaced. In fact, it’s one of the most energy-efficient presses currently available. 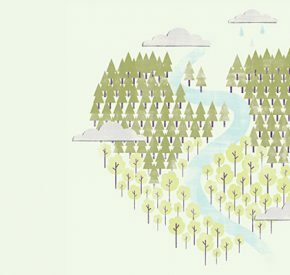 All the paper we use is recycled or produced from sustainably managed forests. We are FSC accredited (Licence code: FSC-C140438), and hold an ISO 14001:2015 certificate for our environmental management system. 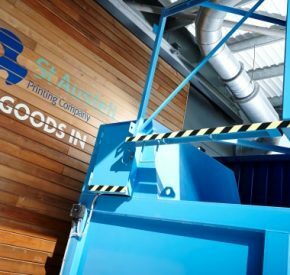 We use effective recycling schemes which are reducing, and attempting to eliminate, print and paper waste in landfill. We recycle 100% of our paper waste and 95% of our total waste (we’re working on the rest). We make any damaged paper into pads and use scrap paper for printing internal emails and documents. We use vegetable based inks, and any waste ink is taken away and used as fuel in furnaces in place of coal, gas or oil or used as a hardening in making concrete. Our Suprasetter Platemakers can process chemical-free or processless thermal printing plates. All our plates are recycled. We engage in a number of carbon offsetting schemes through our partners and suppliers. For example, we use Woodland Trust office paper for our copiers and office-use which is produced using zero CO2 emissions from fossil fuels. This isn’t an exhaustive list – we could go on (and would be rubbish dinner party guests). We’re doing everything we can to be sustainable, focusing on continually improving our environmental performance. This is an ongoing process for us. We’re committed to working with the environment to show that when done responsibly, printing is a clean, green industry which is inherently sustainable. 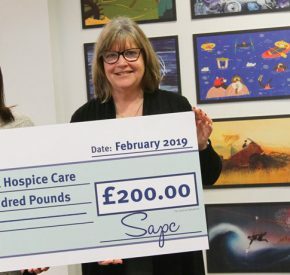 We’re a local company with local connections: supporting charities and organisations, working closely with people who share our environmental and ethical values, and championing prosperity in Cornwall. 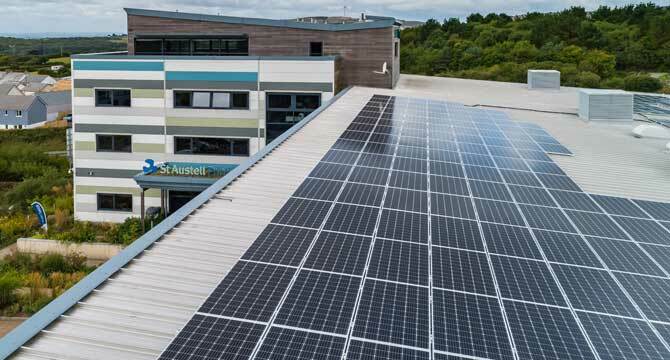 St Austell Printing Company has made a significant investment in meeting its sustainability goals, by unveiling one of the largest roof-based solar panel arrays in Cornwall.